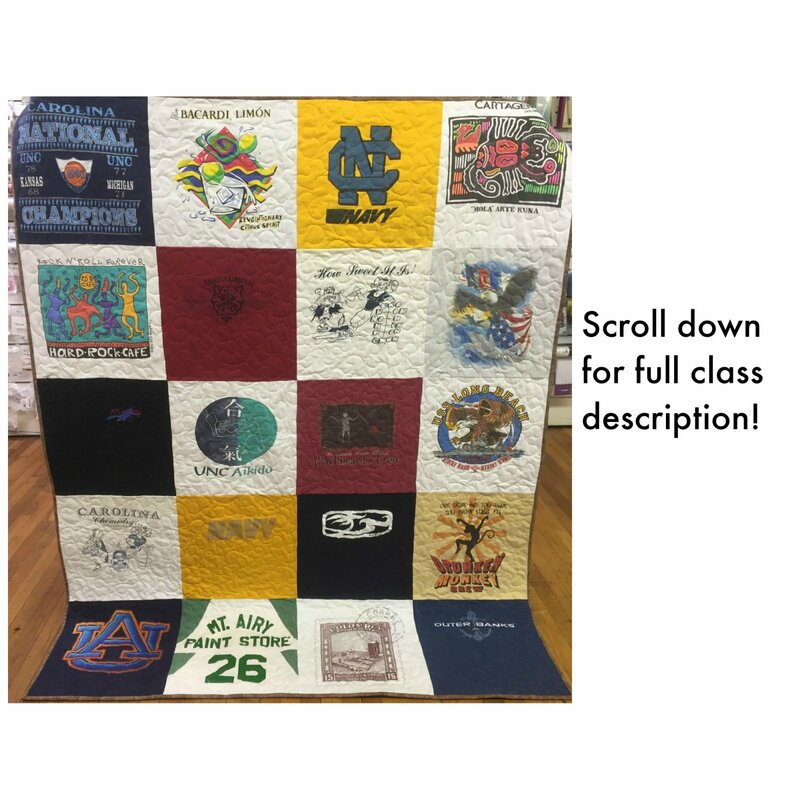 T shirt quilts are a great way to preserve your memories, and the process doesn't have to be difficult. Most of your time and effort involves cutting your t shirts and using a special backing on them, called stabilizer, that makes the t shirts easy to work with. In this workshop, we will prepare your t shirts, cut them out into squares, and sew them together. We will not take on the actual "quilting" portion of the project. There are professional quilters that are available to turn your quilt top into a quilt. A quilt is made up of three layers: the top, the batting in between, and your backing. Once the layers are quilted together, the outer edges are applied-- this is called your binding. Usually this is sewn on the front of the quilt by machine and hand stitched on the back. Your professional quilter can take care of this as well. For this workshop, because it is for extreme beginners, we do not recommend you quilting the quilt yourself. You can't retrieve your memories if this portion doesn't go well. Depending on the size of the quilt, the quilting portion will cost you about $100-$125. Your t shirt quilt can consist of either 9, 12, 16, 20, 25 or 30 t shirts. This makes the format listed in the picture. For this beginner workshop, we are going to do a simple square quilt, meaning all the blocks will be the exact same size. We know they are cute with they are made in all different sizes-- and that can be your second quilt. A follow up class will be scheduled if you're attaching the binding of your quilt on your own after it's quilted. Things you need: (When purchasing from Creative Sewing Machines for this class, you'll receive a 25% discount). Although we do have several rulers to use during class, you will most likely need one to continue working on your project at home. We have several machines that are available for class use. They must be reserved in advance. If you are bringing your own machine, please make sure it is in good working condition and that the stitch looks pretty on the front and the back. As you can see, the supply cost, stabilizer, backing fabric, and quilting cost does add up. We are trying to list out everything you need in order to do the project so there are no misunderstandings. Expect to spend a minimum of about 8-10 hours to get your quilt top finished. Plan to enjoy the process and not attempt to get this done quickly. As my grandmother's voice often rings in my ears-- "Haste makes Waste"! You're creating a memory that you'll love and feel proud of, so give it the time and effort it requires!